As heard on NH Public Radio, WZID, seen on WMUR Channel 9, and has been featured in Parenting NH, Backyard Poultry, Woman’s Day, and Reader’s Digest for her chicken stories and adventures in thrift. As a mother of 6 bright and entertaining kids being thrifty has always been a way of life for Wendy. Now with economic times being so tough, she finds herself creating new challenges and sharing what she has learned about saving. Wendy is a firm believer that having fun and creativity does not need to break the bank. These are the kids who inspire the challenges. Wendy Thomas is journalist who wrote a long running column for The Nashua Telegraph: Simple Thrift. It described simple, real, honest-to-goodness things you can do to save money, because after awhile even pennies add up. Wendy has written several newspaper series. One chronicled her decluttering adventure where over the course of a year she and her kids removed over 5,000 pounds of unwanted stuff from their house. Another series described seasonal thrift saving tips and ideas. She is currently chronicling the experiences she and her family are having while raising backyard chickens as a source of food (eggs only – Wendy refuses to eat anything that has been given a name). What had started off as a challenge to be thrifty has turned out providing endless hours of entertainment, as well as, life lessons on the care and feeding of kids and animals. As a contributor to the Savvy B2B Marketing blog, Savvy B2B Marketing Wendy also shares her journalistic marketing experiences and advice on writing marketing and advertising copy. Wendy lives in New Hampshire with her tribe of kids, her husband, 34 egg-laying hens, and her 3 (very yappy) Maltese dogs. She is available for presentations on thrift, raising backyard chickens, and creative parenting. You definitely seem to be careful and diligent in your use of resources. Nice blog. I went to school at U.N.H and I run a practical living blog at http://www.scordo.com. Maybe we can exchange guest posts at some point! Wendy, Great blog! We are thinking about backyard chickens. Keep up the great work. Love your blog! Boy, oh boy…could we have tea and talk. My husband, and I have six children as well, two crazy dogs, and many extra kids are part of our daily routine too. Thanks to an interview I did on Lisa Haselton’s Reviews and Interviews, I found out about your blog. So glad to have found your blog! Found out about it from Susan who is doing a story about NH bloggers for Parenting NH – we’re both being featured – exciting! I absolutely love your blog! I spent several hours reading every entry from your first to most current yesterday and today. 🙂 I especially love your chicken stories, which is what had lured me in the first place. (I’m newly obsessed with chickens- raising 4 little peeps right now, and 1 with an injured leg who’s recovering). You have made my day! What a wonderful thing to say about my blog. Thank you (and you should get some kind of reward for reading it from the beginning). Congrats on your little flock, as you know once you’ve been bit by the chicken bug it’s very hard to stop. We’re looking forward to getting our new batch of chicks in just a few weeks. Let me know how your beautiful birds are doing (send pictures) and thanks for joining our online flock. this ia a great page Wendy- Im enjoying it! We just started raising chics when my husband brought 7 home on a Sat. I was working. He was just going to “take a look” not buy and called me on his way home saying, “We have chics!” I did some research and got concerned immediately about salmonella (sp?) contact with our son, who’s only 2 yrs old. I had him start selling the chics off as a result of my research. 2 were just sold off this past weekend so we now have 5. Can you tell us about the safety concerns with toddlers and chics. According to my reading and research the recommendation is to wait until your child has a healthy immune system, age 5 was suggested. I don’t want to be an alarmist though or overkill the worry factor. If it’s safe somehow I’d LOVE to keep the chics and have eggs from our house not the store! Pretty much all chickens have salmonella in their gut. To some extent it is considered normal flora, it is only when a bird is sick and compromised that it becomes a problem. (I’d be willing to bet that almost all of the packaged chicken in a grocery store is contaminated with salmonella). Sick animals should always be kept away from elderly people, very young children, and those with compromised immune systems. But if you have a private well cared for flock (healthy, well fed, bedding changed on a regular basis, etc) your birds should not pose a problem even with young children (think of the tots who gathered the eggs in Little House on the Prairie). Chickens and Kids have co-existed for ages. My kids play with our chickens and gather the eggs all the time. I’m no more concerned about them handling the chickens than I am about them kissing the dogs (which is MUCH more disgusting, do you know where that mouth has been??). Even if you have a well taken care of flock though, you should still use common sense and wash your hands after you handle the birds or eggs. Hi Wendy we would love to have you speak about extreme couponing at our Family Fun Day for the moms that will attend with their families. Give us a peek at http://www.liliguanausa.org and we hope that you can join us. Bring your children they will love the event. WOW- look at all this stuff. We should talk about thrift stores and clutter and saving money- that is my life. I’m still using an “empty” bottle of dishwashing liquid I added a little water to two months later. Also have the family brush their teeth over the kitchen garbage can to keep it smelling minty fresh – especially in the summer months…. Okay, Mike – game’s on. You have 6 kids and then we’ll compare notes on saving money (hint: even a lot of money with 6 kids is not enough money). In the meantime, I’ll be at the local yard sales finding winter coats, ski goggles, and ebay things. Just a note about feeding chickens meat products…being new to the chicken keeping business and because I witnessed my chickens fighting over a mouse my cat captured in the yard, I thought nothing about my chickens eating meat. I found some old fish fillets frozen in water in our freezer, thawed them out, baked them lightly and then mixed them together with old fashioned oats (to stretch the servings). My chickens fight with each other and then with the cat to see who will get the biggest share of this mixture. Who knew? I now use this protein and grain mixture to supplement both the cat’s and the chicken’s feed. Hi Wendy, I was an original follower of Amy Dacyczyn and still have all of her original Tightwad Gazette newsletters (before the book, and before blogging!) since good advice never goes out of style. 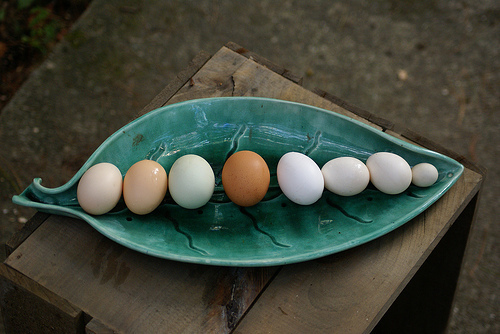 I began raising heritage chickens on Cape Cod in April, 2012. They are pets, six hens from NH, they earn their feed. I can’t say that about the cat and dog. I got to your sight looking for frostbite images, it’s the dampness that gets them more than the temps. I’m always looking for thrifty tips that are worth the effort vs. savings, so will keep reading. Welcome to the flock. I also have all of Amy’s original newsletters, they are one of the few resources that I will never get rid of. Although I talk a lot about thrift, (I’ve written newspaper columns on being frugal) my focus is on living a good life and learning from my kids and chickens (and dog) in NH. You’ve got me beat with 34 layers! Wow! We’ve got 15 with another 6 in training. 🙂 I’m so glad to have found your blog through the NH writers’ website. From thrift to chickens, we’ve got a lot in common, and I can’t wait to dive into more of your posts. Hi Wendy, I have a question about your blog. Would you mind emailing me when you get a free moment? Thanks! Thank you for your inventive, funny, and important mammo-graham recipe. What a great idea to bring focus to such an important medical test.